Why Do So Many Startups Get Product Marketing Wrong? 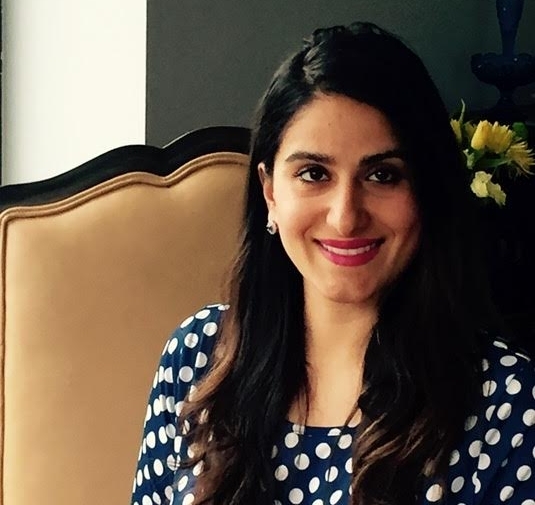 Yasmeen Turayhi, former Global Product Marketing Lead at AdRoll, has taken over 200 software products & features to market across various growth stages from seed to Series D & acquisition. She comes from a diverse background with experience in multiple disciplines and industries from finance and energy to payments, blockchain, healthtech, adtech and marketing technology. Many startup teams fail to bring in product marketers with the right skill sets at the right time, and end up paying for it with failed product launches. Because product marketing is a relatively new role, a majority of technology companies don't know what product marketing is or how it's different from marketing, growth marketing, digital marketing, brand marketing and product management. What do product marketers do? How are their goals different than those of marketing, growth and product management? How do we know if and when we need to hire a product marketer? Then, I walk through how I break down the role of a product marketer - their key responsibilities, how those responsibilities align to different phases in the product growth cycle, and when is the right time to hire. Clarify the company’s overarching business goals, initiatives, product roadmap, decision making structure, culture, and brand. The 10 questions to ask leadership when starting a new project. 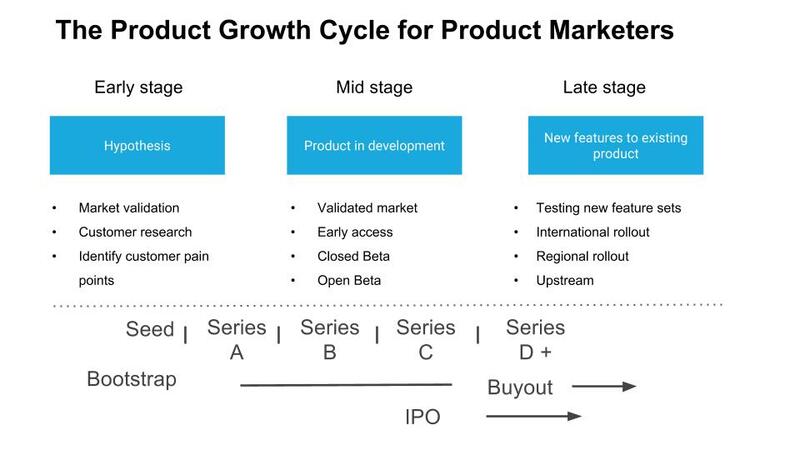 Assess the stage of the product’s growth cycle - early, mid, or late stage. What activities is the company engaged in? What stage of funding is the company in? Then, I’ll dig into where companies go wrong when it comes to product marketing and how to avoid common pitfalls. My goal in sharing the process is to help teams and product marketers alike determine if, when, and how they should be working together, and identify the pitfalls that may prevent them from delivering the right product to the target customer at the right time and driving customer adoption. What is the company’s larger mission? What are the overarching business goals? What initiatives are they pursuing in the quarter and year ahead to achieve those goals? What does success look 3-6-9-12 months from now? What gaps exist that may prevent the company from reaching its goals? Is there time, capital, and an openness to additional testing for an existing product roadmap? Where operationally or strategically can I make changes? How do they want the brand and company to show up in the market? What is the core culture of the company? Is it product-led? Marketing-led? Design-led? Or governed by some other underlying value system? Who are the key decision makers? Spending time focused on the larger goals of the organization is the most important place to start. If the team and the product marketer don’t know the answers to these questions, if they are vague, or better yet, if the leadership team thinks it’s a waste of time to establish or review them, everyone will have a big problem on their hands down the road. Every team in the company should be working towards a common goal - whether that’s revenue, user growth, retention, or to become an industry innovator & thought-leader. There will be more unknowns for early stage products, but regardless of the stage of growth, you need to have answers to these questions to ensure you’re working on the right things. The risk of skipping this step is that you’ll end up being ineffective, tinkering away on something in a silo. This happens a lot. Understanding existing goals and gaps is critical to delivering value. Every project is different, and every company and team chooses to optimize towards various objectives, and has different obstacles standing between them and their goals. Working within the existing culture and leadership structure is equally as important. Some companies are “product-led,” like Facebook, others are “marketing-led,” like Apple, and others are “design-led,” like Airbnb. Understanding the often unspoken rules of how different companies make decisions, and which executives are the key decision makers, is crucial when creating and executing a strategic go-to-market plan. Once I’ve gotten a clear picture of the answers to these higher level company questions, I then have a foundation to move to the next step of determining where the product is in its growth cycle. Which growth stage is the company or product in and how does that align to its product life-cycle? A product marketing manager's scope of work and focus is largely dependent on the company’s or product’s growth stage, and the growth stage is highly correlated with the product development lifecycle. To help me determine which growth stage a product is in, I’ve broken down the product growth cycle into three phases - early, mid, and late - and identified the activities teams generally engage in at each stage. The types of problems teams are trying to solve and the initiatives they’re pursuing to solve those problems, tell you much of what you need to know to identify the growth stage. Additionally, funding stage is often (but not always) a useful indicator in assessing where the product falls in the growth stage framework. When I begin working with a new product, I use the framework pictured above to determine its stage. Making this call early on sets me up to accurately determine where I can make the biggest impact against the overarching goal. For example, I recently started working for a company in the seed to series A stage, and I spent a majority of my time focused on customer research and working with the engineering teams to determine the right MVP to build before moving on to a beta program. After digging into the company’s goals and culture with leadership, and assessing where the product is in its growth cycle, my next step is to define a hypothesis on where I can make the biggest impact against the goal of ensuring customer adoption. This hypothesis helps me decide what to work on and where to focus my efforts. Let’s dig into each bucket individually to get a clearer picture of the day-to-day work of a product marketer, and how it differs from marketing, growth and product management. In the market validation phase, product marketers collaborate with cross-functional teams to conduct customer research and testing. They also generally do the market research to understand the competitive landscape and pricing considerations. When it comes to customer research, they work with various teams to create a master list of questions to gather business, operational and technical insights from customers. Product teams generally focus on technical or product requirements, business development & sales teams focus on business questions, and user experience teams focus on usability. These various cross functional teams focus on very different parts of the market research process, and it’s the product marketer's job to centralize the inputs and align them with the company’s larger business goals. It's also their responsibility to bring together all components of the customer research process and present the insights to the company. By composing and telling the story, product marketers share the context leadership needs to make informed strategic decisions that balance customer needs with those of the business. Giving all teams a master document to use in creating product assets to ensure consistent branding & messaging. Additionally, during this phase product marketers work closely with many cross functional teams, like legal, finance and brand, to mitigate potential legal risks when building out the messaging and launching and packaging the product. One of the most important parts of a product marketer’s role is to create a go-to-market (GTM) plan. The GTM is a blueprint or roadmap that accounts for all of the inputs into how the company will take a product to market, build a competitive advantage, generate demand in the market and ensure customer adoption. 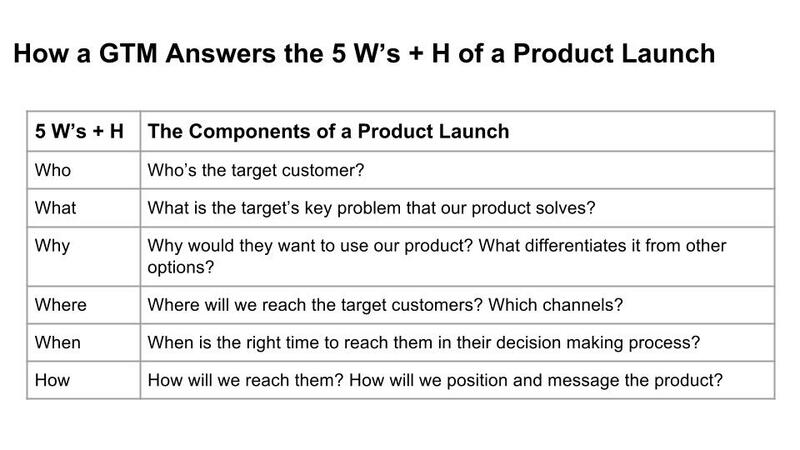 It answers the who, what, where when, why and how of a product launch. Product marketers “quarterback” the entire operational, business, and product roadmap for a launch. They ensure the right assets are created, from marketing content to sales collateral, and that all internal and external communications about a product are strategic and timely to enable a successful launch. Once the product has been launched, new prospects are considering the product, and customers are using it, product marketers must analyze performance of the funnel inside and out. They need to study each step of the buyflow, figuring out where, when and why customers are dropping off or churning. Once they understand the gaps in the funnel, they can optimize on delivering the assets where customers are stuck or leaving. Below, is some of the pre and post product launch work that is generally completed by a product marketer, while working closely with the creative and acquisition marketing teams and the product manager. 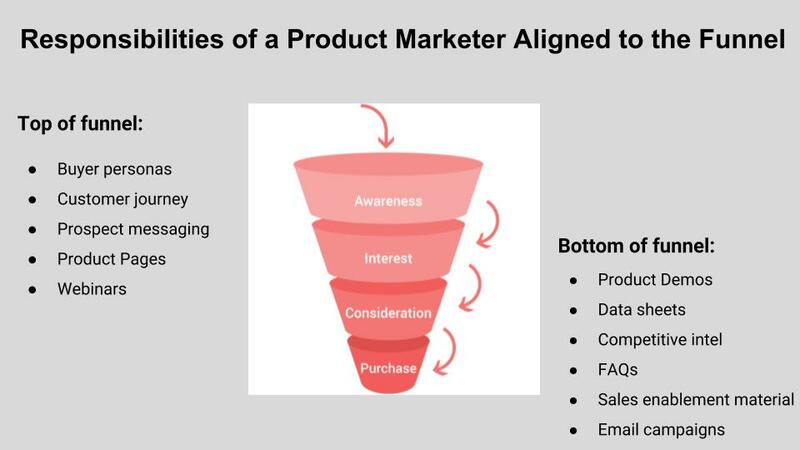 Product marketers own the entire funnel, and are responsible for creating the full suite of assets that move customers through the funnel to purchase. At the top of the funnel they engage in activities focused on demand generation that produce brand and product awareness, such as creating buyer personas, product pages, webinars and other assets. At the bottom of the funnel, they work on assets and activities that offer more detailed explanations of the product to drive customer conversion and purchase, such as product demos, sales enablement materials, email campaigns and more. For example, if customers are getting stuck at the conversion stage, a good product marketer would double down on producing the right materials to ease conversion. In one particular product launch, we saw that prospects became interested in the product when they were introduced to the benefits. The problem was that they got stuck at the set-up and sales enablement stage. To address the issue, we worked with the product team to improve the buyflow with in-app user experience changes, followed by a product demo that walked the prospect through the set-up process. In general, when product marketers are working to improve the funnel, all of the strategies and tactics they employ should align with the larger company strategy and be in service of the company’s goals. This kind of alignment with the company’s target outcomes facilitates buy-in across the company. In an ideal world, a product marketer is empowered to join these 3 buckets of activities together into a complete 3-step product marketing journey of market research and validation, positioning and framing, and finally, GTM & execution. Allowing them to embark on this 3-step journey in its entirety, increases the team’s probability of successfully building and launching the right product and features and driving adoption. In reality, this is most often where companies go wrong when it comes to product marketing - they fail to consider and bring on product marketing early enough, during the beginning phases of product development. They make matters worse by asking the newly hired product marketer to work on positioning, framing, and GTM, without allowing them to start with understanding the customer. This is problematic. The underlying foundation for driving a successful launch is developing a deep understanding of the customer - and this happens before positioning, framing and GTM. Bringing a product marketer into the mix late in the game, and skipping the research phase, sets the product marketer, the rest of the team, and the product up for failure. Often, during the product development process, product managers or business development partners sync with customers. But this isn’t enough to develop a deep understanding of the customer. These team members are generally interested in understanding the problem as it relates to their own role and responsibilities, and don’t extend beyond their immediate domain to develop or communicate deeper, holistic insights on the needs and psychology of the customer. To exacerbate the issue, they store a majority of the customer feedback they receive in their own heads. Product marketers work closely with product managers, growth marketers, business development, business operations, and other partners, depending on the company. Because a product marketer’s primary responsibility is to deliver the right product to the target customer at the right time, cross functional collaboration with many other teams is essential to build the optimal product roadmap and feature set. While some teams own a majority of the information on a particular topic, it is a product marketer’s responsibility to understand the key themes, construct the story of the product launch, communicate it across a broad and diverse audience of functions, and earn buy-in from leadership. An effective product marketer will understand these cross-functional dependencies, identify the customer unknowns, do the research, document learnings and create a GTM strategy coordinated with product, business, and operational functions. Just as important, they will take the lead on communicating the strategy to leadership, and other stakeholders. This part of a product marketer’s job is so important because it’s impossible to launch and service a product unless the entire company rallies behind the launch. And this kind of cross functional collaboration and buy-in takes time to build and needs to start early in the product development process. Based on my experience of launching multiple products, the best time to hire a product marketer is as soon as the company hires a product manager. Because product marketing exists as an extension of product management, with a focus on the market adoption of a product, a product marketer is best set-up for success when they can work closely with their product manager. Bringing the product marketer in at the early stages of a product development roadmap, allows the company to be strategic and proactive about customer adoption rather than reactive. Being proactive requires building growth and customer adoption into the DNA of the product from day one, rather than trying to bolt it on later. And hiring a product marketer to help bridge the gaps between marketing, growth, and product, will meaningfully increase any team’s chances of success when launching a new product.